WTI prices collapsed after spiking as high as $55.24/b yesterday. WTI opened at $52.49/b today, a drop of $1.71, or 3.15%, from yesterday’s opening price. 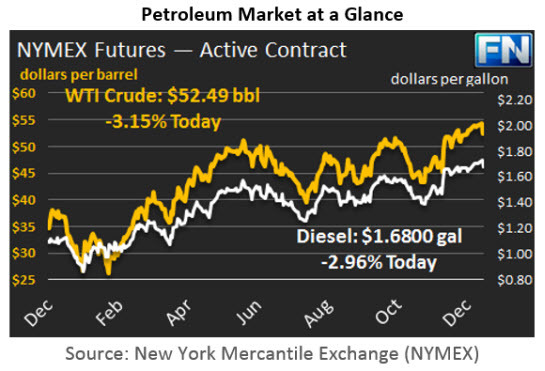 Prices are currently $52.65/b, $0.16 above the market opening value. WTI prices had not closed above $55/b since the first week of July in 2015, eighteen months ago. 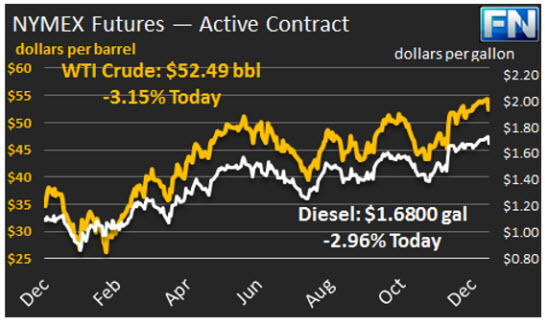 The price did not last, and WTI prices are roughly back to where they were before the holidays. Early bullish sentiment had been encouraged by Oman announcing that supplies would be reduced, with the target being a cut of 45,000 bpd, and Kuwait reporting that it was cutting output by 130,000 bpd. However, Bloomberg reported that Libya is quickly ramping up production from its newly reopened Sharara field in the south west, and that it plans to ship nearly 1.9 mmbpd of crude this month from it Zawiya port near Tripoli. OPEC listed Libya’s November 2016 total crude production at 575,000 bpd, so the additional supply could overwhelm the amount being cut by other OPEC members. A wave of profit-taking ensued. The U.S. Dollar index also rose, placing pressure on crude prices. Distillate opened at $1.68/gallon in today’s session. This was 5.13 cents below yesterday’s opening price. Current prices are $1.6829/gallon, 0.29 cents per gallon above opening, but the price trend appears to have a slight downward tilt in early trading. RBOB opening prices have declined in three consecutive sessions. RBOB opened at $1.6322/gallon, a drop of 4.18 cents, or 2.5%, from yesterday’s opening. Prices are currently $1.6344/gallon, 0.22 cents higher than the opening price, and the price trend looks roughly flat in early trading. Previous ArticleThe Long Decline in Convenience/Motor Fuel Site Count is at an End.